THIS EVENT IS NOW SOLD OUT. PLEASE CONTACT OFFICE@SYNAGOGUE.ORG.UK TO BE PLACED ON THE WAITING LIST FOR TICKETS. 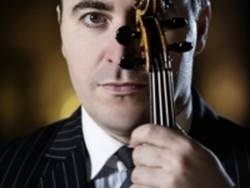 Music at Belsize is delighted to announce an evening with Maxim Vengerov – truly one of the most gifted and inspirational musicians of our day. Known for the brilliance of his violin playing, Vengerov is tireless in his search for creative expression and different styles of music, from classical to baroque, jazz to rock. More recently, he has turned his energies to conducting, often performing a major violin concerto in the first half and conducting a symphonic work in the second; yet however great his achievements and whatever international stage, each performance remains intensely personal. Belsize Square Synagogue, which has its own rich musical tradition, has developed a unique partnership with Vengerov which has its origins in his long friendship with our own Rabbi Stuart Altshuler. Both passionately believe that teaching and encouraging young talent without sufficient means is a fundamental and in keeping with Vengerov’s belief that competition is a platform to support and launch young artists’ international careers. This special event, designed for Belsize Square Synagogue, starts with a reception. The concert will include well-known classical repertoire performed by Vengerov and his accompanist along with the world premiere of a piece written for him by Ella Altshuler. Following the concert, there will be a private and discreet reception with Maxim and friends in a more intimate setting away from the Synagogue. Information available from the office. Please click here for tickets and more detail. An additional donation is required for the post-concert private reception. Please email enquiries@musicatbelsize.com with any queries. All proceeds from this event will go equally towards two causes – the Belsize-Vengerov Foundation which has been established as a project under our joint stewardship for fostering young musical talent and to Belsize Square. BSS members have a priority booking period until 8 August for both this event and the private reception. We much look forward to sharing a unique, inspiring and enjoyable evening with you, your family and friends – an evening which will be remembered for much time to come. Click here to book your seats for this event.